The following are few architectural constraints that will make any web service RESTful, as discussed by Roy Fielding, inventor of REST in his research paper. This constraint states that client and server implementation should be independent, both should be able to scale, evolve independently of each other. Client should only know URI of resource on server nothing else. Server should return the appropriate response based on received request from the client. Client-server interaction should be stateless in nature. Server should not store state data and response should totally depend upon the information present in the request from client. Client can however store keep session state data. This enhances scalability, reliability of interactions. Cache comes into the picture to solve the issue of stateless nature of REST. This cache is implemented on client end, and cacheable response is cached. If in future client request some data for which it had already sent a request, instead of sending the request to server again, cache can reuse the cached response. This states the need of uniform interface between components, every resource in server should have only one logical URI and should expose methods to access this resource, and it should follow standard naming conventions. All resource should be accessed using common approach. This enhances visibility of web interfaces. Layered system approach states that web service should follow layered approach, i.e. we should divide our web service in different layers that cannot see beyond their immediate layer, e.g. authentication layer, data access layer, message processor layer. This reduces system complexity and improves scalability. This states that occasionally client can download executable code instead of static data, i.e. JSON/XML. It increases system extensibility. GET: This will be used to get articles from data store of TGS web application. POST: This will be used to create a new article in TGS web application. PUT: This will be used to update any existing article or create a new if it does not exist in TGS data store. DELETE: This will be used to delete an article from TGS data store. Extra request sent to server to specify type of response, encoding, and content type and customized parameters. Etc. When trying to create a resource, the resource data is sent in body of put request. Web server returns data in body of the response. Suppose client sent a GET to query data for python category, web server will return data in response body. These coded returned with the response, and signifies the status of the request sent to the server. These similar to HTTP response code. E.g. 200 OK denotes request succeeded, 404 NOT FOUND denotes resource not found on server. Let’s create a simple REST web service using flask in python, we could consume this web service using Postman tool or Curl command line utility. We will expose REST endpoints to add, modify, delete, and update the articles. CRUD functionality over REST. First, import flask module inside the code and name our web service as shown below. Next, create resource articles, it will be a simple List of articles , we can also use a database to store out resource. Next, we need to create the api endpoints and the required REST methods as show below. POST method will insert new article data in list of articles and returns inserted data with response code 201 created. If record already exists it returns error code 400 bad request. PUT method will overwrite the record and return the data along with response code 200 OK. If record does not exist, it creates the data and returns it with response code 201 created. DELETE method deleted the record if exist and returns the data with response code 200 OK. Otherwise 404 not found. Our final step is registering our resource to REST API and assign a URI to it. Let’s test this using Curl utility, we could use postman utility also it’s a great tool. As you can see C++ category record is updated. 100    18  100    18    0     0  18000      0 --:--:-- --:--:-- --:--:-- 18000"c++ is deleted." 100    21  100    21    0     0  21000      0 --:--:-- --:--:-- --:--:-- 21000"category not found"
Recommended exercise: Use MySQL or any database to store articles and implement data access layer to provide CRUD functionality over REST. Well, you assume that I fully understand what code belongs to server side and which belongs to client side but I don’t. Sorry, I don’t fully understand what part belongs where. Simple and to the point explanation of REST. Is a resource. Thank you for another great article. 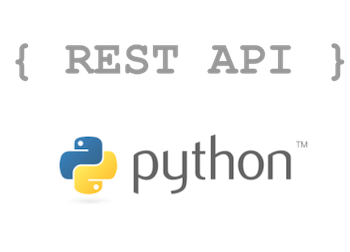 I would like to request that you make (or recommend me) an article about consuming a REST API with OAuth2 and a Callback URL, in Python. I’m having issue understanding how to implement the concept of the Callback URL in a desktop application.